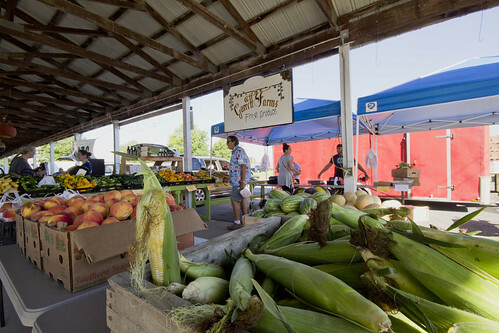 If you’ve watched the steady growth of the Paducah Farmers’ Market over the past decade or so, you have noticed the vendors who have been mainstays for quite some time—the ones who helped build the market into what it is today. One such farmer is Danny Garrett with Garrett Farms. You may have spotted him there, donning his straw hat and worn, denim overalls. He’s a western Kentucky boy through and through. While he’s been around the area for much of his life, his journey to become a local producer provider wound its path around the country and through the middle east before landing him back on Kentucky soil. Eventually, Danny caught the attention of Sheikh Zayed, the then President of the United Arab Emirates. “One of my horses had been there and won a race, and he wanted babies from that stallion. I worked through the Royal Stables in Abu Dhabi. We’d ship horses to England, where they were raised, then back to the Sheikh.” Danny realized that if he was working for the Sheikh, he could do that just as easily from back home as he could anywhere else. On the farm, Danny built some greenhouses in order to get about a month’s head start on the growing season. He also took note of what customers wanted, tweaking his crops according to demand. He also found new markets such as a buyer in Chicago who prefer to get heirloom tomatoes from Danny. “They’re going crazy for those up there,” says Danny. He’s also been taking his goods to produce auctions and various vendors, always looking for new markets.